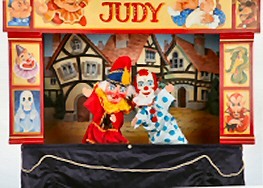 Book a Punch and Judy Show. Professor David Wilde's World Famous Wonders. 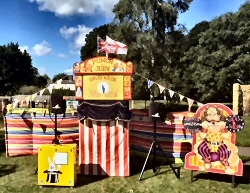 On the street or in the home, on showground, park or village green, Professor David Wilde entertains children and adults alike with traditional skills of Magic and the authentic Punch & Judy Show. He collects puppets and ventriloquist dolls, his speciality being Punch and Judy figures where he is a considered a leading authority. 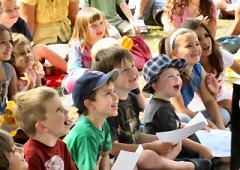 In fact he is frequently consulted to establish values when puppet artifacts come to Auction. He is a true enthusiast and this comes over in his performance. 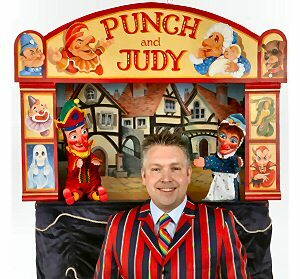 He is rated by his peers in the Punch and Judy profession as one of the best and most authentic shows to see. 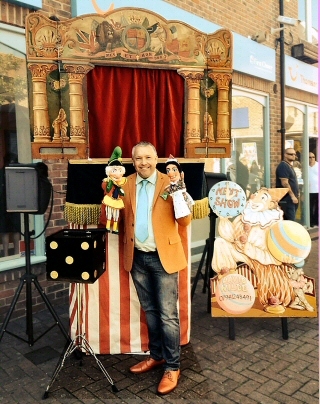 In addition to his Punch and Judy skills David also presents Ventriloquism, Balloon Modelling and Magic. 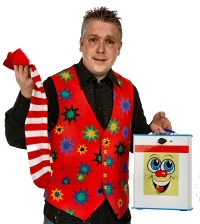 He is a skilful all round children's entertainer and offers a great deal of experience. David Wilde performs shows in the following areas of London: Abbey Wood, Acton, Aldgate, Anerley, Balham, Barbican, Barking, Barnes, Barnet, Battersea, Bayswater, Beckenham, Belgravia, Bermondsey, Bethnal Green, Bishopsgate, Blackfriars, Blackheath, Bloomsbury, Bow, Brent, Brentford, Brixton, Broadgate, Brockley, Bromley, Camberwell, Camden Town, Camden, Canary Wharf, Cannon Street, Catford, Charing Cross, Charlton, Cheapside, Chelsea, Chingford, Chiswick, City of Westminster, Clapham, Clapton, Clerkenwell, Covent Garden, Cricklewood, Dagenham, Deptford, Docklands, Drury Lane, Dulwich, Ealing, Earls Court, East Dulwich, East Finchley, East Ham, Eltham, Enfield, Fetter Lane, Finchley, Finsbury, Finsbury Park, Fitzrovia, Forest Gate, Forest Hill, Fulham, Golders Green, Grays Inn, Greenwich, Guildhall, Hackney, Hammersmith, Hampstead, Hanover Square, Hanwell, Haringey, Harley Street, Harrow, Hatton Garden, Havering, Hendon, Herne Hill, High Holborn, Highbury, Highgate, Holborn, Holloway, Homerton, Hornsey, Isleworth, Isle of Dogs, Islington, Kennington, Kensington, Kentish Town, Kew, Kilburn, Kings Cross, Knightsbridge, Leadenhall, Lee, Leicester Square, Lewisham, Leyton, Leytonstone, Lower Edmonton, Maida Vale, Manor Park, Mansion House, Marylebone, Mayfair, Mill Hill, Monument, Moorgate, Mortlake, Muswell Hill, New Cross, New Oxford Street, New Southgate, Nine Elms, North Finchley, North Kensington, Notting Hill, Oxford Street, Paddington, Palmers Green, Peckham, Penge, Pimlico, Plaistow, Poplar, Putney, Regent Street, Regents Park, Richmond, Rotherhithe, Royal Exchange, Shepherds Bush, Shoreditch, Smithfields, Soho, Somerset House, South Norwood, South Tottenham, Southgate, Southwark, St James, St James's Park, St Johns Wood, St Pancras, St Pauls, Stockwell, Stoke Newington, Stratford, Streatham, Sydenham, Temple, Thamesmead, The City, The Hyde, Tooting, Tottenham, Tower Hamlets, Tower Hill, Twickenham,Upper Edmonton, Upper Holloway, Upper Norwood, Vauxhall,Victoria, Victoria Dock, Walthamstow, Walworth, Wandsworth, Wapping, Waterloo, Westminster, West Brompton, West Ealing, West Kensington, West Norwood, West Wimbledon, Whetstone, Whitehall, Willesden, Wimbledon, Winchmore Hill, Wood Green, Woodford, Woolwich. 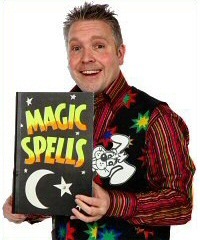 David Wilde performs shows in the following areas of Kent: Ashford, Aylesford, Beckenham, Belvedere, Bexley, Bexleyheath, Biggin Hill, Birchington, Broadstairs, Bromley, Brompton, Canterbury, Chatham, Chislehurst, Cranbrook, Dartford, Deal, Dover, Edenbridge, Erith, Faversham, Folkestone, Frindsbury, Gillingham, Gravesham, Gravesend, Greenhithe, Herne Bay, Hextable, Hollingbourne, Hoo St Werburgh, Hythe, Isle of Sheppey, Isle of Thanet, Keston, Longfield, Maidstone, Malling, Margate, Medway, New Romney, Northfleet, Orpington, Queenborough, Rainham, Ramsgate, Riverhead, Rochester, Romney Marsh, Royal Tunbridge Wells, Sandwich, Sevenoaks, Sheerness, Sheppey, Shepway, Sidcup, Sittingbourne, Snodland, Southborough, Strood, Swanley, Swanscombe, Tenterden, Thanet, Tonbridge, Tunbridge Wells, Walderslade, Welling, West Malling, West Wickham, Westerham, Westgate on Sea, Whitstable, Wigmore, Willesborough, Wilmington. Birthday parties, Weddings, Christenings and Christmas parties, Summer fetes, Festivals, Street Fayres and Carnivals, Craft fayres, Agricultural shows, Parks and Zoos, the Seaside. Promotions in Shops, Shopping centres, Corporate entertainment, Tourist attractions, Grand openings and Product launches.Schools, Nurseries, Playgroups and Drama groups. Talks and demonstrations to Colleges, Women's Institutes and other adult groups.